I have held this cake post hostage for 5 months. 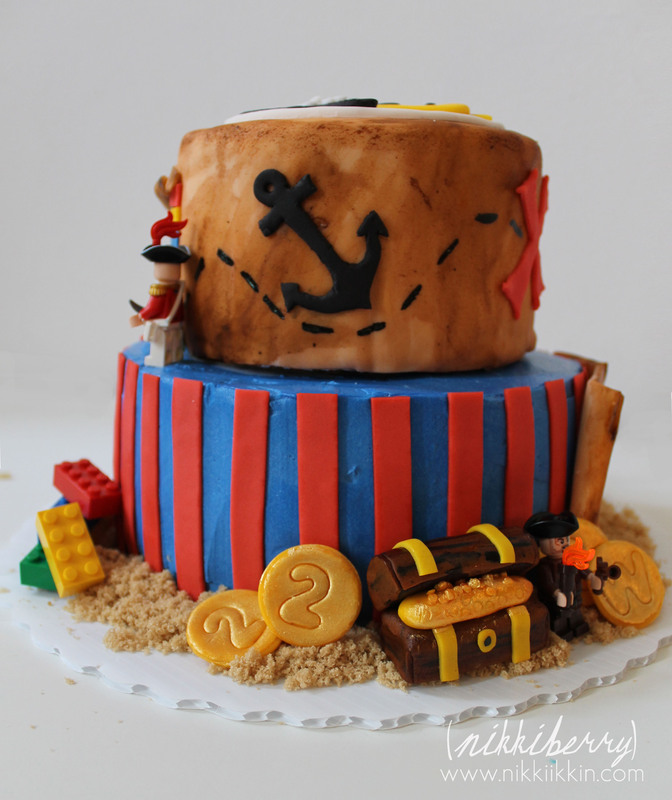 Im not sure why I have taken so long to post it, its one of my favorite cakes ever! 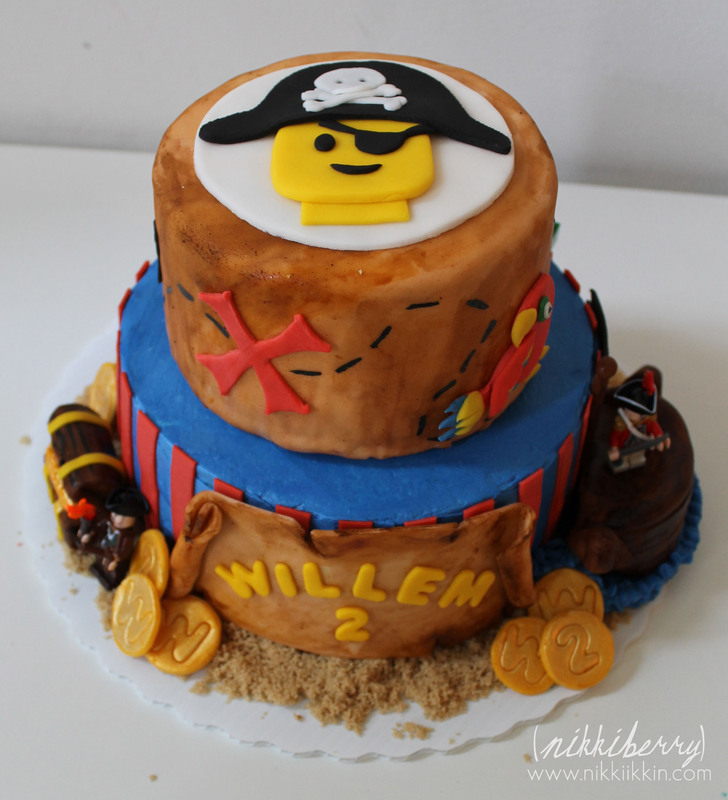 This Lego Pirate cake is a real eyeful. Its design is four-sided and has so much detail to find on each turn it was hard not to be click heavy with my camera. 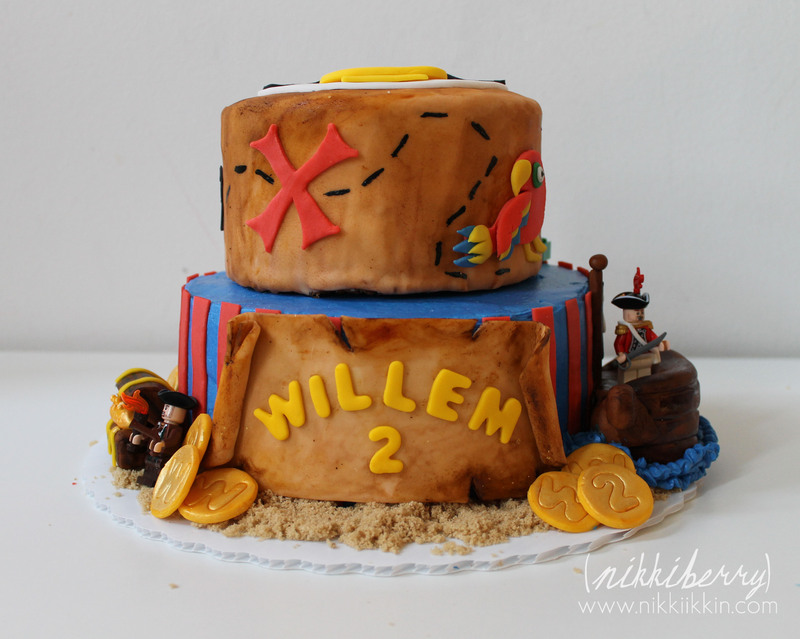 This cake was for a cute little boy, Will, that lives down the hall from me and is a playmate of my son’s. His mom, Nicole is a super chic lady. When we sat down to together to discuss the cake we instantly clicked and the ideas flowed easily. I squeezed all of those ideas into this little cake and think its one of the best original cakes I’ve ever executed. 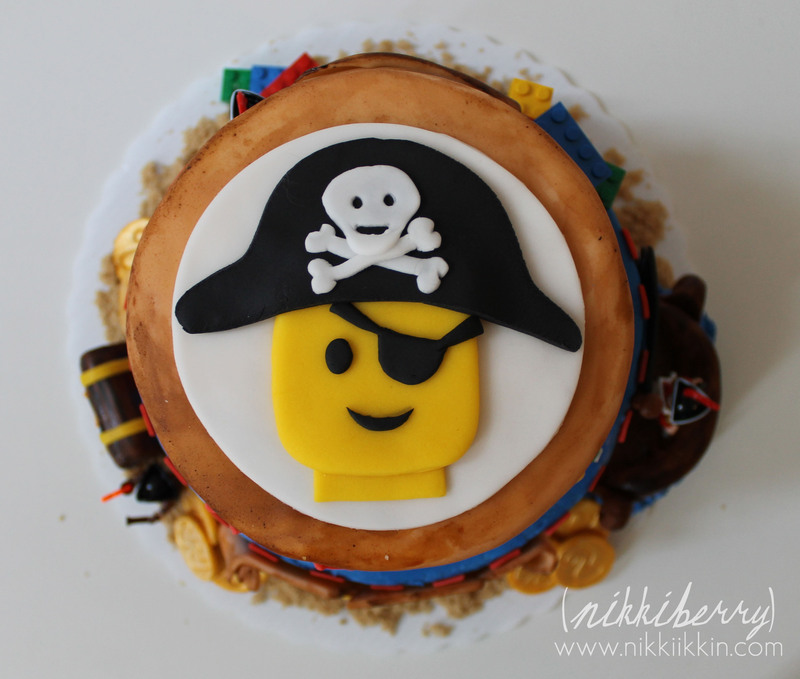 The party theme morphed from just pirate to Lego Pirate after Nicole’s husband designed a Lego Pirate invitation for the party. 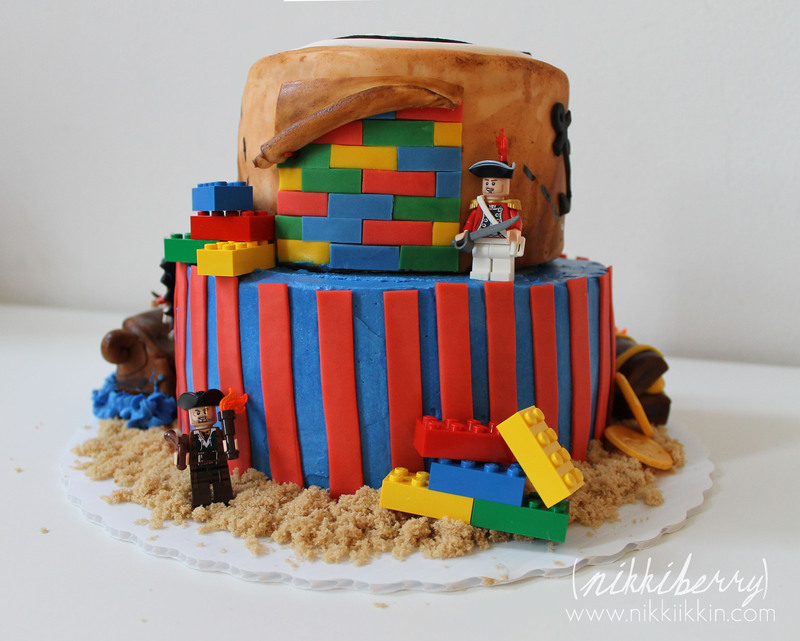 I instantly knew that I wanted to do a peel away Lego wall on the cake, its a cake design that I’ve always thought was whimsical and fascinating for little kids to see, as it looks like the cake is made from Legos and the sugar covering is peeling off. 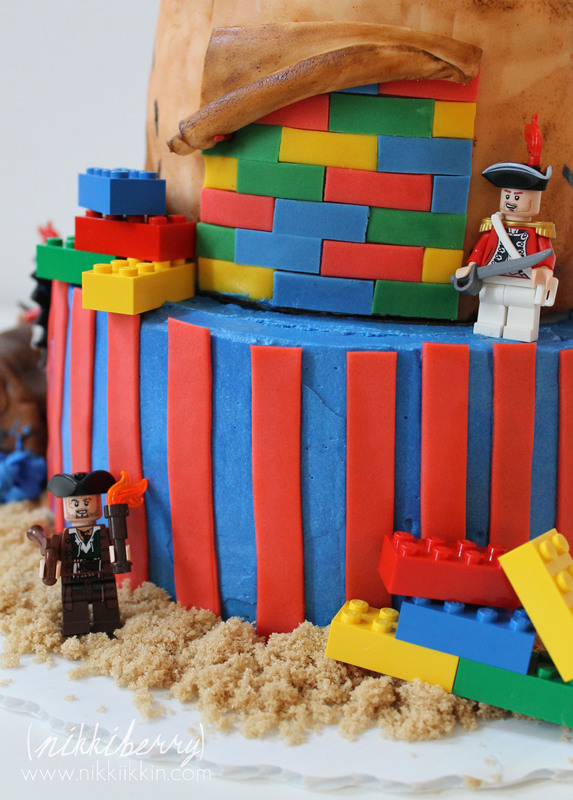 Sometimes its paired with a construction theme and it looks like the Lego Men are constructing the cake. I also knew that Im not the type of cake artist that needs to recreate what is readily available to feel that my cake is successful. I had no intentions to make Lego Men or Lego Blocks when my design called for true to scale anyway. 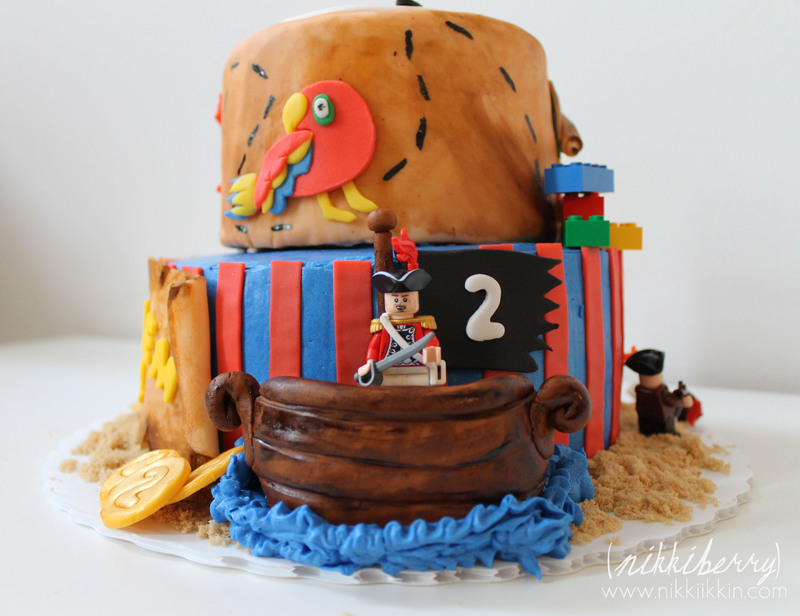 This cake is full of pirate elements like a treasure map, gold coins and pirate ship. The design was really about mixing all those elements together and balancing the colors and pieces. Each side is a little scene. 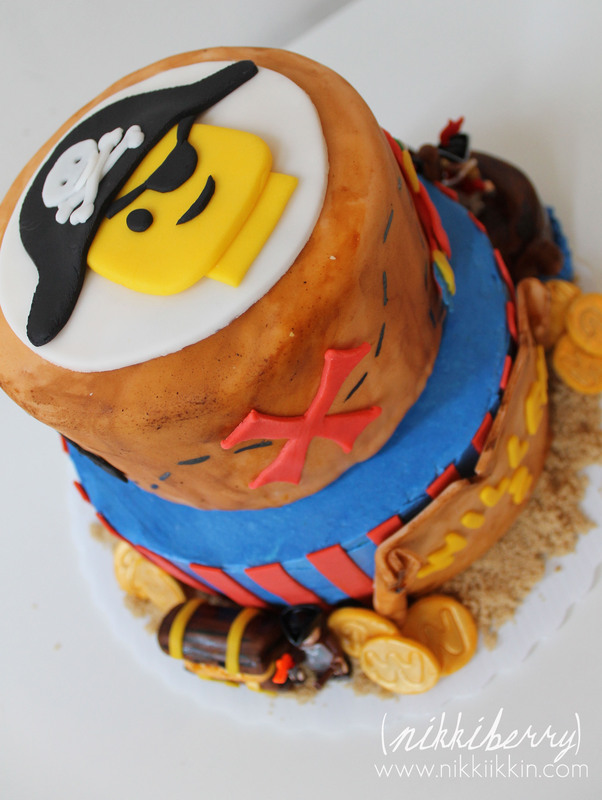 With the back being the most surprising, the fondant is peeled away to suggest that the cake is made from a pirates booty of Lego Bricks. Heavily guarded by Lego Pirates the bricks take on a sense of treasure themselves. By using real Lego Men and Lego Bricks I made it a little easy on myself in the details. But Im never one to take the easy road, I enjoy a challenge and put a lot of work into creating more elements on a cake than I typically would. The treasure map dashes around the second tier to locations that include a parrot, anchor and finally the infamous red X. 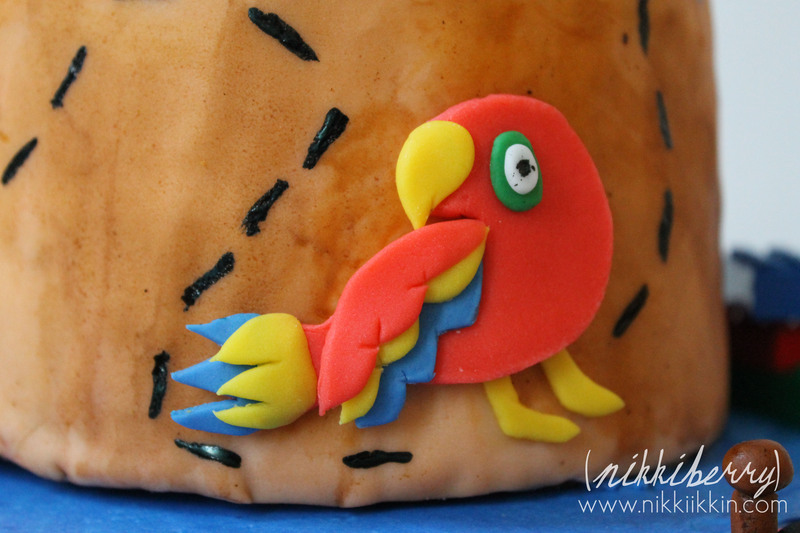 One of the biggest obstacles I face on cakes is coming up with innovate ways to create an element. 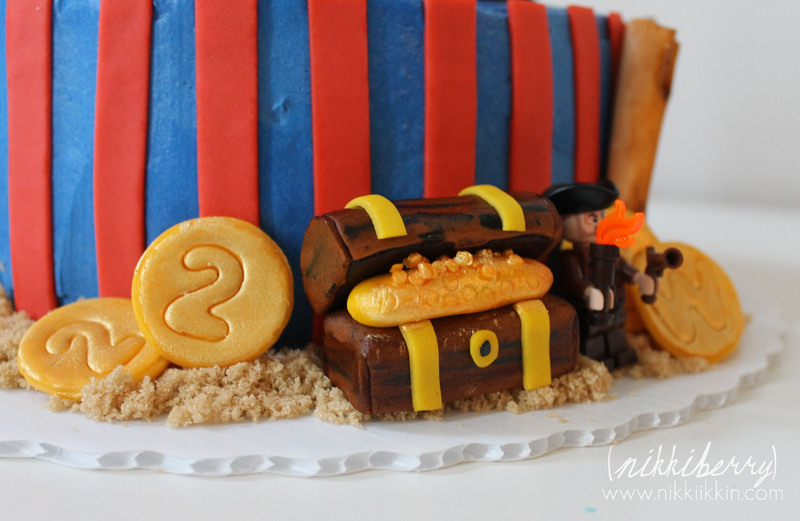 While its easy to just mold a large hunk of fondant into something, I wanted the treasure chest and pirate ship to be delicious too. Both are made from Little Debbie brownies. I needed to make those pieces quickly and I wanted them to be sturdy. The Little Debbies molded like play doh in my hands and the fondant laid on smooth and effortless. I think it was a better base to work with than rice crispy treats. At the party I knew they were a big hit when all the children tried to claim them as their cake piece. My daughter being 10 years old and my son being only 2, I have a lot more experience doing girl themed cakes. I surprised myself on how much I really enjoyed creating this cake. Boy themes are growing on me! 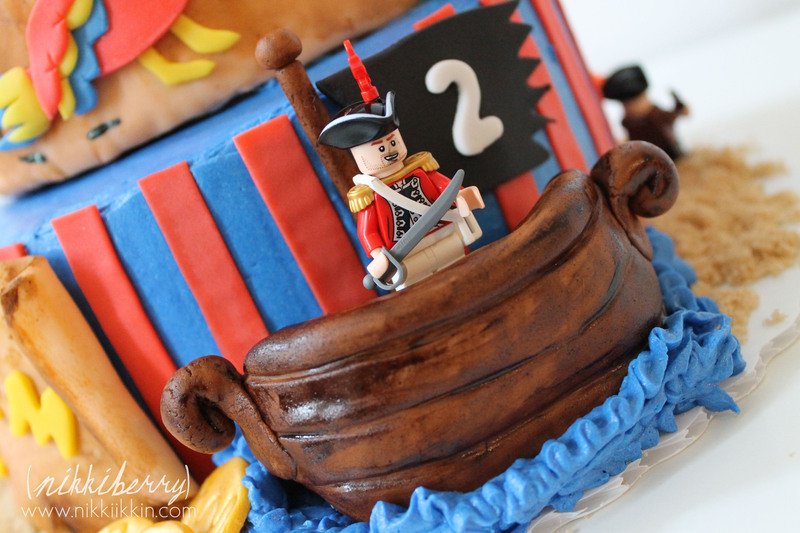 This cake could easily be created for a pirate party without the Lego theme. Just imagine a skull and bones as the flat topper and remove all the Lego toys.